Queen Victoria is supposed to have insisted that 'coals' for the palace fires were made trom trees at Burnham Beeches, near Slough. These trees, distorted by centuries of lopping and regrowth are typical ot many old woods near London. Dozens more must have been uprooted and built over. In addition there are about 25,000 acres ot beech - tall forest, not ruined coppices - within an hour's drive from London. Their presence is mainly due to the furniture industry. The work of the chair makers was done halt in the woods, the 'sticks' being turned on open-air treadle lathes. These men and their masters were careful not to use up the wood faster than it grew. Now their trees are tall - the last chair bodger retired a few years ago. The National Trust protects some of the woods, others are still managed for timber. Beech is next to oak in value and, sawn instead of split and turned, is still a basic material of furniture - not always visibly. Much of the wood is imported. The greatest concentration of beechwoods is on the Chiltern Hills. The trees thrive as no other on the steep escarpment of the chalk, their long roots exposed on the shallow soil. But they reach their most majestic heights on the plateaux above, where the chalk is overlaid with deeper soil. Beech is not exclusively a calcicole: it will grow on many well-drained soils. In the northern part of Epping Forest it shares the gravelly ground with hornbeam. At Burnham Beeches there is gravel, little chalk. 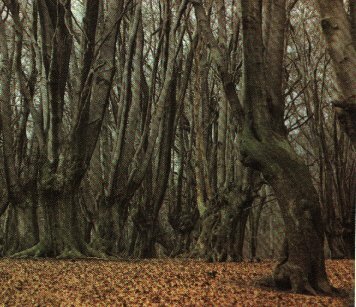 There are many beech plantations all over Britain, often far from chalk or limestone. Ancient pollard trees are a feature of old common land in the south-east, often at lane sides where people had the right to 'fair loppings'. There are old pollard beeches in the New Forest, on common land. Beechwoods remain on all the downs and in the Cotswolds often as preserved 'hangers', surrounded by sheep pasture or, more frequently now, by smooth arable fields. There are impressive beech hedges in north Somerset and high beechwoods near Buxton at over 1,000 feet. Lines of beeches as shelterbelts have been planted in northern England and Scotland: the tall trees not their usual grey, but green with algae or white with lichens. Beeches in large plantations in the lowlands of Scotland as far north as Aberdeen are a surprise to the Southerner. A plantation usually has trees of noticeably similar ages, while a natural beechwood - or any other wood - is marked by the dissimilar ages, shown by thickness of trunk. A wood which has been left alone will also have its share of dead trees. The high beechwoods, though they have an immemorial look about them, have usually grown up from trees which were once regularly cropped at an age convenient for making logs which could be cleft and shaped for the turners. Trees of more than 200 years are said to be unusual. Some giants were, no doubt, left as parent trees. There is no reason to suppose that many present-day beechwoods are not on their original native sites. Ecologically the beech, as our tallest forest tree, forms the climax of a natural succession described by Tansley: 'from grassland through scrub sometimes with ash; then oak, the native tree of widest distribution and most adaptable habit.' Beeches will grow in the shade of oaks when the soil suits them, and theme is nothing to stop the eventual formation of a pure, tall beech forest which is self-perpetuating. The shade is too deep for other trees to regain dominance. Certain types of scrub - box and juniper- are directly colonised by beeches. Natural clearings, caused by dead trees, are quickly filled by wind-seeded annual herbs or by brambles, usually present in creeping, flowerless, form on the beechwood floor. Seedling beeches, which start everywhere in the dark woods but normally end as crackling twigs, here get their chance to grow up through the plants which filled the gap; sometimes they are accompanied by the odd yew, holly, or cherry, seeded by the birds. The evergreens can grow easily in the surrounding shade;the cherry can overtake the sapling beeches and reach the hundred-foot-high canopy to take its share ofthe sunlight. At its edge, the beechwood expands over the scrub with the help of jays, pheasants, mice, and squirrels, until it reaches soil too heavy (or more usually, farmland). It will gradually advance through adjacent mixed woodland until, on less favourable soil, it fails to compete. This is the textbook situation and you may test it in action anywhere along the Chilterns, where a great variety of scrub (identified elsewhere in this book) occupies the more exposed escarpments - and woodland of various types besides beech can be found on the plateaux and the dip slopes. The early history of the beechwoods is confused and open to conjecture: their distribution, at least in England, in the period immediately before the Roman occupation, is almost as wide as the present planted distribution. 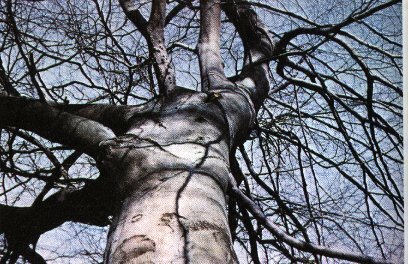 The massive pollen deposits of other common trees, which are preserved in peat, are, in the case of the beech, absent, for its most favoured habitat is the chalk. Pollen is, in any case, not over-abundant and is likely to remain within the confines of the beechwood where gales are subdued. Theme are widely scattered macroscopic remains. Our present intergalacial period was well advanced, by six or eight thousand years, beforethe beech became established in Britain. By this time the country had been invaded by farming peoples, and no one really knows whether the beechwoods or the farmers came first.